More than 20 Goshen College students from across the United States and the world gathered Thursday for a Thanksgiving meal at the home of Jason Samuel, a Goshen College communications professor. Mentors help shape us into adults: Columnist Sara Alvarez ’12 thanks her mentors for their help. 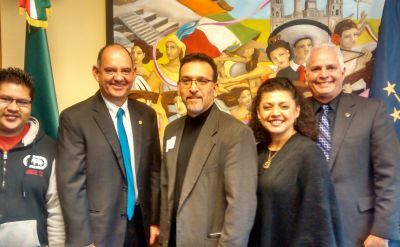 The Mexican Consulate in Indianapolis and Goshen College will together award $40,000 in scholarship aid to GC students of Mexican heritage during the 2014-15 school year. Toughing out the cold with hats, gloves and some dancing, a group of 50 people stood outside the Elkhart County Courthouse in Goshen Tuesday afternoon, Nov. 25. Late Tuesday afternoon, a group of about 50 gathered in downtown Goshen to let their voices be heard. Unrest in Ferguson has spread to Goshen, as students from Goshen College gathered outside the courthouse to protest the grand jury's decision. Protesters in Ferguson aren't alone. People are voicing their anger about the decision across the country. Michiana included. Goshen College students held a vocal, but peaceful protest. They waved their signs and even got cars and trucks driving past to honk their support. And they had a lot to say about race and police in the U.S.
As new forms of electronic communication continue to raise doubts about the future of print, one Anabaptist-Mennonite periodical is defying the odds. 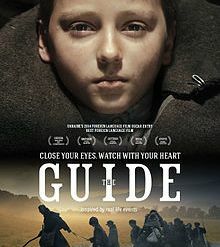 Professor Solomia Soroka’s son, Anton Greene, stars in “The Guide,” a Ukrainian drama that was recently submitted to the Oscars for consideration in the Best Foreign Film category. A special showing of the film will take place on Saturday, Dec. 6 at 2 p.m. in the Goshen College Umble Center and will include a talkback session with the director, Oles Sanin.